Task: Global player and the fully-certified complete supplier for dental practices and dental laboratories, Sirona Dental Systems GmbH was in the market for a new vertical machining centre to produce high-precision titanium sleeves. The replacement machine needed to be smaller, more flexible, easier to handle, faster, more economical, more reliable, and at least as precise as the "previous machine". Solution: Talk to FANUC about a FANUC ROBODRILL. Within an hour of calling FANUC, a rep was on site presenting a ROBODRILL α-T21iFa. Quickly convinced, Sirona made the order a week later. Eight weeks later the ROBODRILL was on the shop floor milling sleeves – the fastest machine tool order in Sirona’s history. Result: The α-T21iFa has been in operation since September 2012. Praising the machine, Sirona’s Process Planning Expert Stefan Gibbert said “we now know that it can do more than we expected. It is a pleasure to work with a machine like that. Unlike the previous machine, it has no maintenance difficulties. And even if the spindle ever had to be replaced, the cartridge is the cheapest and quickest solution without dramatic down times”. Dental patients always dread the thought of "drilling". But drilling is a normal routine here in the world of machine tools. Stefan Gibbert (Dipl.-Ing. ), Process Planning Expert in the Instruments division at Sirona Dental Systems GmbH, Bensheim, talks about and extremely rapid machinery investment made by the total solutions provider of dental equipment. The FANUC ROBODRILL required only eight weeks from the initial discussion to the first chip. That was in September 2012. It quickly became an integral part in the pool of some 50 CNC machine tools within the "Instru-ments" segment. By now it has probably already machined the 100,000th titanium sleeve for turbine- or motor-driven dental treatment instru-ments, and "tomorrow" it may be used for further integration of precision mechanics to mill and drill new, more sophisticated components. Sirona Dental Systems GmbH, Bensheim, Germany, is a global player and the top certified full-range supplier for dental practices and dental laboratories, with branch offices and production facilities all over the world. Some 3,000 employees work for this premium brand worldwide – 1,400 in Bensheim alone – for the four divisions CAD/CAM (computer-aided restoration), imaging systems (radiology), installations (dental treatment units/chairs) and instruments. In the latter, there are 180 experts with 50 machine tools offering a high degree of vertical integration – it's practically a factory within a factory – with an unprecedented level of self-sufficiency. From A to Z, from order placement to gear specification/toothing with hightech standards in the tradition of Swiss and Southern German engineering. This always goes hand in hand with admin-istration, design, programming, quality assurance and compliance engineering. Manufacturing uses roughly 80% standard materials: stainless steel of every grade, titanium, bronze, nickel silver and aluminium. The processes: turning, milling, drilling, superplastic forming, grinding, honing, along with heat treatment, corundum blasting, pickling, glass bead peening, die sinking and wire-cut EDM, as well as gearing technology (especially for motorised instruments). This is but a brief overview of the full manufacturing capabilities, including assembly into products such as straight and contra angle handpieces (driven by electrical motor), turbines (pneumatic) and other dental instruments such as ultrasound scalers, endodontic contra angle handpieces and spraying devices. Stefan Gibbert, who manages process planning of purchased parts, has a degree in mechanical engineering. It just so happened that the investment in a new CNC machining centre was on the agenda. It was supposed to be smaller, more flexible, easier to handle, faster, more economical, more reliable, and at least as precise as the "previous machine", a Central European brand. "We know FANUC controls from many of our machine tools; we too have this brand of robot deployed as a 24/7 operator on a machine. It was in fact my superior, Jürgen Schreiber (Dipl. Ing. - FH) from whom I learned about the FANUC machining centres. On the same day, I phoned the responsible representative, Mr Werner Kaliga. One hour later, he was there at our company, presenting the FANUC ROBODRILL α-T21iFa, and one week later, we gave him the order. Eight weeks after the initial contact, the ROBODRILL milled its first chip. That was in September 2012, the fastest machine tool order in the history of Sirona, and my first capital investment project," says Gibbert, describing the sequence of events. Six or 10 ultra-thin, extremely sturdy titanium sleeves – weighing 2 grams each, 100 mm long, 20 mm OD, 0.2 mm wall thickness, precision specification exceeding 30µm – are clamped into the multi-clamp clusters of the tool. In the four-axis ROBODRILL α-T21iFa centre, machining begins on both end faces of the sleeves. Exit holes for light guides, as well as connection fixtures for individual parts mounted on both sides of the sleeves, must be bored and milled – 15 different models or seven different outer geometries. Six testing dimensions are scanned and monitored. Afterwards, the parts are (still) manually removed: "Cycle time 60 seconds! With 1.6 seconds chip-to-chip changing time, divided by the number of sleeve clusters, that is a tremendous performance gain compared to the 'previous machine' …," admits the instrument expert, "… and FANUC requires one-third the footprint and offers all the preparations for full automation – at an extremely attractive price". He also speaks highly of the significantly faster kinematics in the X, Y, Z and A axis (rotational axis), as well as the user-friendliness, reliability and considerably easier maintenance of the ROBODRILL. Because in parallel to the primary processing time, the operator, Nils Klöss, can deburr the finished set of sleeves and manually drill colour marking bore holes: "We intend to gradually integrate that step into the main processing time of the machine. We also want to develop a more intelligent solution for handling the sleeve … it is more complicated than usual, given the free-form surface of the parts," says Gibbert, as regards potential deployment of a robot. Then the company could ramp up from one- or two-shift operations to otherwise typical three-shifts per day. Zero defects, with practically zero waste. This complies both with the expectations of Sirona's own "stringent" QA and with international standards – DIN ISO EN 13485 and FDA approval, along with all worldwide applicable standards that this leading full-range dental equipment supplier fulfils. The head of the air-driven dental treatment instrument is capable of 450,000 RPM. This requires that all the components be accordingly rugged and precise – including the sleeve. Deviations in tolerances must be eliminated completely. The negative consequences are easy to comprehend for anyone who has felt the drill on his own teeth. Thus the "prestige part" that emerges from the process, e.g. the sleeve, is the largest precision engineering component in Sirona's "Instruments" division. It is made out of ultra-thin titanium, freely formed in a superplastic process as a standard part, machined in various steps and finished into instruments: "We practise lean manufacturing with smaller lots, in order to respond flexibly just-in-time to customer requirements. Without large inventories, yet with an extremely wide variety of parts, we achieve short throughput times in order-related manufacturing and assembly," explains Gibbert (Dipl.-Ing.) the "Instruments" strategy. According to information from Stefan Gibbert, the ROBODRILL is equipped with more features (e.g. spindle monitoring, warping control, nano-interpolation, automation preparation), in order to soon master more complex processes even without an operator. 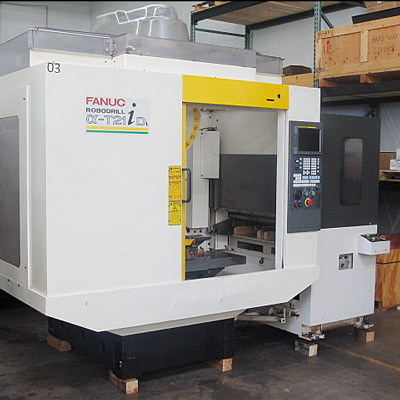 "The FANUC α-T21iFa has been in operation since September 2012, without any problems, achieving normal results. We now know that it can do more than we expected: it is a pleasure to work with a machine that, unlike the "previous" machine, has no maintenance difficulties. And even if the spindle ever had to be replaced, the cartridge is the cheapest and quickest solution without dramatic down times. This counts in terms of follow-up projects in which we would prefer a single source for all our needs – automation, handling, controls, CNC machining", explains Stefan Gibbert and closes with the motto of the group leader of plant maintenance: "the machine I know the least is the one I like best, because I am not constantly being called in for troubleshooting." Asia is the one of the most dynamic growth markets in the field of dental equipment. China has initiated a government programme by which 60,000 dentists are to be trained per year. Europa and America are traditional, stable markets for Sirona, with sustainable, modest growth rates. The 2009 crisis didn't faze Sirona – the company continued to hire specialists and invested in facilities (new R&D Centre) and equipment, gearing up for the boom economy starting in 2010. Good prospects for 2013: the company is continuing to invest. Construction is fully underway on a new precision engineering facility (approx. 3,000 m² of floor space). And there are plans to equip it with CNC technology, partly also with expansion investments. Sirona is the technology and market leader in the dental industry and a worldwide partner for dental practices, clinics, dental laboratories and authorised distributors. The company develops and manufactures a complete line of dental products, including CAD/CAM systems for computer-aided ceramic restorations (CEREC), digital imaging systems for intra-oral and panoramic x-rays as well as volume tomography (3D), dental treatment centres, instruments and hygiene systems. With continuous innovations in all areas of dentistry, Sirona has remained at the forefront of technological advancement since the invention of the first electrically powered dental drill (1887). Sirona's innovations set the standards for dental treatment and have had decisive impact for nearly 30 years now on the field of digitisation of dental technology. Sirona employs 3,000 people at 25 locations worldwide, and markets its products in over 135 countries on all continents. The United States is the largest single market for Sirona, followed by Germany and Asia. The company was spun-off from the Siemens Medical Tech-nology Division in 1997 and since 2006 has been listed on the US NASDAQ stock exchange (symbol: SIRO). In the last fiscal year (1 October 2011 to 30 September 2012) Sirona reported revenues of $979 million. Sirona develops and produces the majority of its products in Bensheim, Germany, the world's largest development and production location of the dental industry. Today, Sirona employs more than 260 engineers and scientists, and over the past 6 years, the company has spent in total more than 250 million US dollars on research and development.